Penk started at hometown club Wigan Athletic, long before they were a Football League side. Signed for £2,500 by Portsmouth in 1955, at the time a record for a Lancashire Combination player, he played nine First Division games before a £4,000 move to Home Park in the summer of 1957. 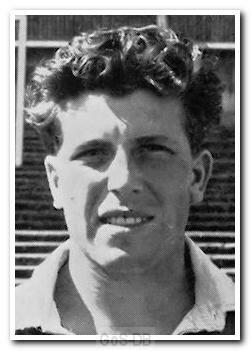 He won a first team place immediately and was a regular in the 1958-59 Third Division championship side, scoring at Accrington in the 1-1 draw that assured promotion. With the team struggling after promotion, he was no longer first choice and in the summer of 1960 moved back along the south coast, this time to newly promoted Southampton. They had two impressive wingers in Paine and Sydenham, but with Sydenham often away on National Service, Saints moved quickly when Penk became available. He played 106 games and scored 14 times with Argyle and made 52 appearances for Southampton, netting on 6 occasions. Away from football Penk was a more than useful amateur cricketer and played in the Hampshire League until he was 50. So my dear friend Harry is 80 not out today. As well as being a professional footballer he was a good club cricketer too. Today may not mark his highest innings but it is an important one nevertheless. Of the eleven survivors from the 21 players used in the 1958-59 season, he becomes the seventh to join the "80 club". Alex Govan leads the way at 85, Len Casey is 83, Barrie Meyer and Eric Doughty are 82. Peter Anderson is 81 (and still playing golf at Staddon Heights twice a week) while Harry and Wally Bellett are both 80. Of the other four, Gordon Fincham is 79, with George Baker, Geoff Barnsley and John L Williams all tied on the 78 mark.